Texas Fights Suit After Denying Birth Certificates To Children Of Illegal Immigrants : The Two-Way The state asked a federal court to dismiss a lawsuit filed by parents who argue the state is discriminating against mothers because of their "immigration status and national origin." An interesting immigration case is winding its way through a federal court in Austin, Texas: A group of mothers has filed suit against the chief of the state's Department of State Health Services Vital Statistics Unit, because it has refused to give their U.S.-born children birth certificates. The issue here is not whether or not these children are U.S. citizens. They are and that's made plain by the 14th Amendment of the Constitution, which says most people born in the U.S. are automatically citizens. The issue in this case is what kinds of identification Texas can demand of their undocumented immigrant parents to issue a birth certificate. According to the complaint, Texas is refusing most forms of ID that undocumented immigrants would have access to. In one case, for example, the Vital Statistics office refused to a accept a matrícula or an ID card issued by a local Mexican consulate. Under state law, Texas can also refuse to accept a foreign passport, unless it "bears a current U.S. visa." Texas Attorney General Ken Paxton, seen hear at his January swearing-in ceremony, has asked a federal judge to dismiss the lawsuit. The mothers claim that the state is discriminating against them because of their "immigration status and national origin." 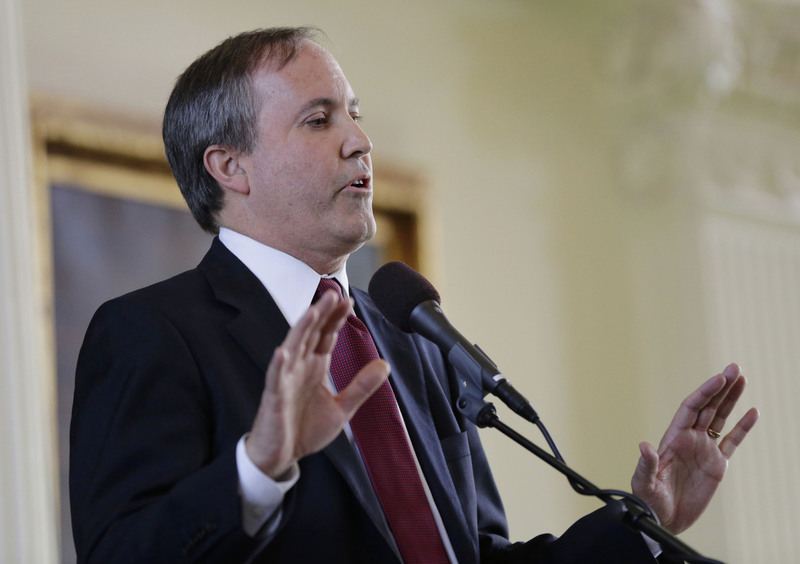 On Wednesday, Texas Attorney General Ken Paxton asked a federal judge to dismiss the case, arguing that the federal judiciary did not have jurisdiction over this matter, because the state enjoys immunity and this involves state, not federal law. "The issuing agency is the United Mexican States, attorney [Efrén] Olivares said. "'I would be curious to see if a similar ID issued from Canada' received the same response, he said." In his complaint, Olivares argued that Texas has accepted martrículas in the past. For example, one of the plaintiffs, Maria Isabel Perales Serna was able to get a birth certificate using that ID when her daughter was born 14 years ago. But when she gave birth to another child, referred in documents as "K.Z.P.S.," last year, she was refused a birth certificate even though she presented a matrícula, a Mexican passport and hospital records. "As a result of Defendant's wrongful denial of the birth certificate, Plaintiff Perales faces serious problems in enrolling her daughter in day care, traveling with her child, obtaining necessary medical care and other health, education and welfare services requiring parental consent and/or proof of K.Z.P.S. 's Texas birth," the complaint reads. Our original post stated that the 14th Amendment automatically confers citizenship on anyone born in the United States. One careful reader rightly noted that this is not quite right: The 14th confers citizenship on anyone born in the United States "and subject to the jurisdiction thereof." As a Congressional Research Service report from 2010 puts it, what that means has been the subject of great debate. Did it mean that the children born to Chinese immigrants — who were once under law not permitted to become naturalized citizens — conferred birthright citizenship? Did it include Native Americans born on a reservation? All those questions were eventually settled in the 1898 Supreme Court case United States v. Wong Kim Ark. "The Court held that the Fourteenth Amendment affirmed the traditional jus soli rule, including the exceptions of children born to foreign diplomats, to hostile occupying forces or on foreign public ships, and added a new exception of children of Indians owing direct allegiance to their tribes. It further held that the 'Fourteenth Amendment ... has conferred no authority upon Congress to restrict the effect of birth, declared by the Constitution to constitute a sufficient and complete right to citizenship' and that it is 'throughout affirmative and declaratory, intended to allay doubts and settle controversies which had arisen, and not to impose any new restrictions upon citizenship." In other words, and as our reader rightly noted, the 14th excludes children born to diplomats or hostile occupying forces and those born on foreign public ships. As a historical curiosity, you may find it interesting that the court also found that the 14th did not confer birthright citizenship to some Native Americans. As the CRS reports, the Nationality Act of 1940 "finally and unambiguously declared all Native Americans born in the United States to be U.S. citizens."